Situated in the heart of Ooty town, this garden has been beautifully laid out in terraces with rose tunnels, pergolas and bowers with rose creepers. 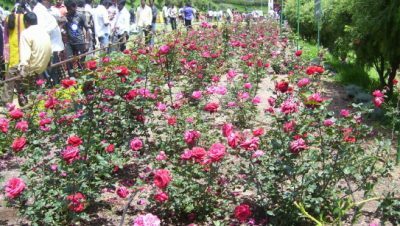 To commemorate the centenary Flower Show, the Rose Park was established at Vijayanagaram in Udhagamandalam covering an area of 4 hectares in five terraces. 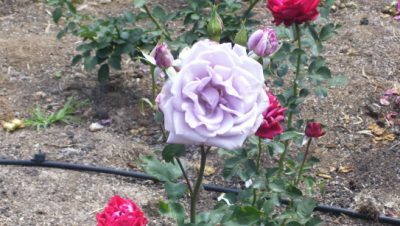 Today this garden has the largest collections of roses in the country like Hybrid Tea Roses, miniature rose, Floribunda, Ramblers, roses of unusual colours like black and green are some of the more than 3,000 varieties of roses that will captivate your senses. The Rose Garden is situated in slopes of the Elk Hill. The rose varieties planted in this park were assembled from different sources. The ‘Nila Maadam’ is located in a spot from where viewers can see the entire rose garden. This garden is maintained by Tamil Nadu Horticulture Department. 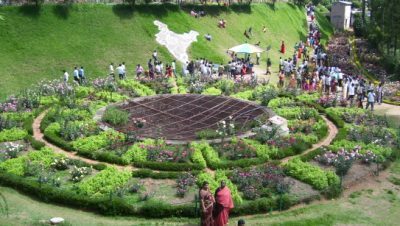 It has also received the award of Excellence for the best rose garden in entire south Asia from the International Rose society in 2006.